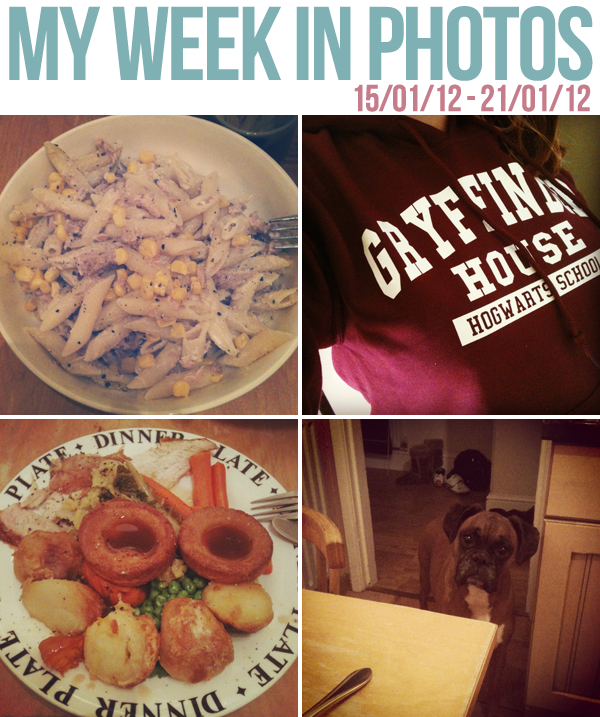 A very busy week in photos! 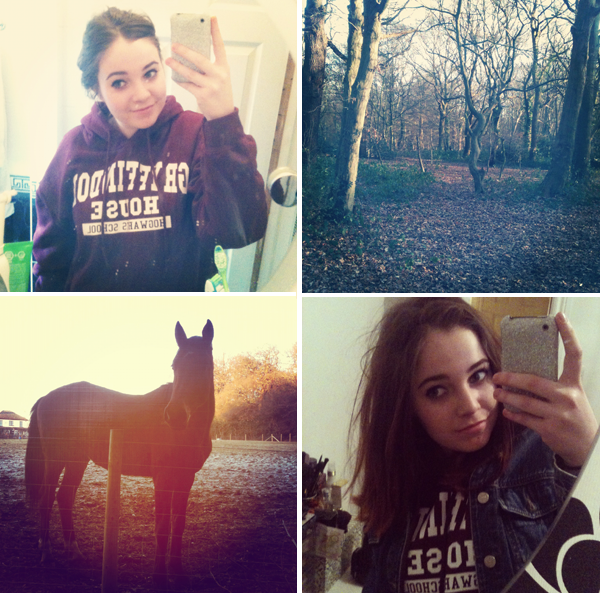 tuna and sweetcorn pasta // gryffindor jumper from ebay // dad's roast dinner last sunday // audience whilst i ate it // spontaneous trip to the forest to walk the dog // met a horse who said hello, then farted // buttered crumpets // page of 'wrecked my journal' // paul from s club 7 followed me! // colour dark room measurements // white chocolate dips // friday's reward for a long week! Back to my usual weekly posts running from Sunday to Saturday; being posted every Sunday! Was actually going to start last week but realised I hadn't taken many photos! I'm always travelling so taking my DSLR about is a bit of a job! This week has been so tough but I've pulled through and now having a lazy Sunday! 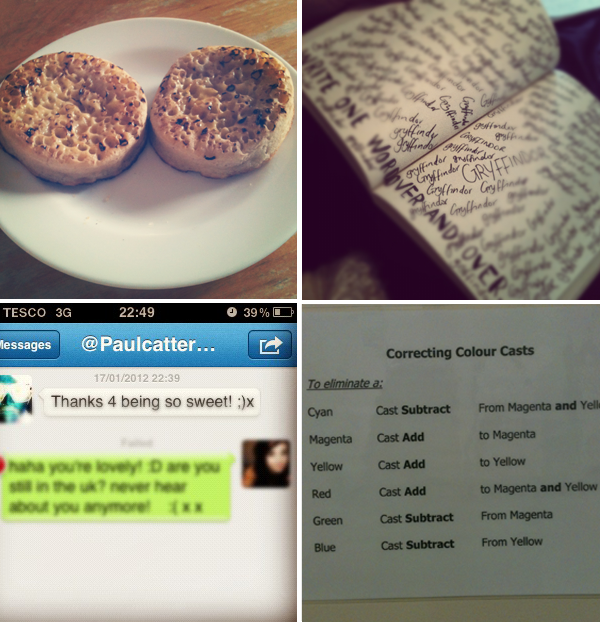 This week has consisted of everyday being busy. I got a letter last week informing me my University interview was on Friday 20th which was short notice considering my portfolio wasn't even halfway finished so I was stressing so much. Even shed a tear or two! However, by Thursday I decided to ditch all of my Grandparents project and just have my Brick Lane project instead. I wanted it to show my creativity and obviously something I want to go into as a career. I am predicted DDD for my final grade which I'm really happy about. Super excited about my next project too which is a studio project so obviously I'm going to do something fashion related! As for my interview, I was really nervous and had 'butterflies' all morning but everything went perfectly and I have been offered a place (still going to work for that overall DDD grade though!). So happy! I also have some really exciting news. You may already know considering I tweeted about it with excitement but I am going to London Fashion Week! I really wanted to go this year as the collections seem more exciting and obviously more colourful compared to LFW a few months ago! However, it's not open to the public so applying for a pass seemed pretty pointless! I have been recommended to work with a fashion photographer and I am literally still starstruck. Not going to reveal who it is but his work is amazing and I will do a blog post all about it once it comes! I will be there on the Sunday. Super thrilled to be seeing Mulberry's and Vivenne Westwood's Red Label collections. So grateful for this opportunity. Now I just need to plan what to wear! Got hardly any time to blog next week so have a few guest bloggers lined up. If you're interested in writing a post for ASHLLYD, feel free to email me! Oh my, Wrecked my Journal is so nice. I love 'reading' that book! congrats on all the fab news :) so good! Just found your blog and LOVE it so far! THAT HOODIE IS AMAZING ASHLEIGH! Love all the other pics especially the horse pic.